My first draft of this piece involved simply making a list of everything that was wrong – everything that I hated – about Hunted. After playing two out of the six chapters making up the main adventure, this list clocked in at 1,552 words. It was obvious I was never going to get through the entire game this way without writing a small book. So when I say that the flaws in Hunted are far too numerous to list, that’s not just a figure of speech: I actually tried. Hunted is a co-op game whose gameplay mechanics have been designed by Kafka and implemented by Bloody Stupid Johnson. 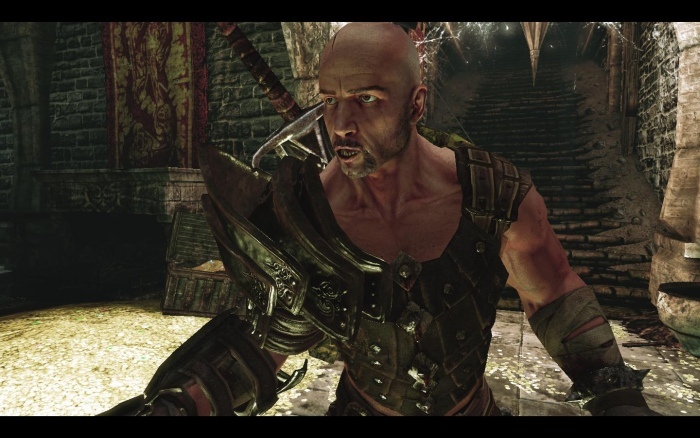 Every single thing about it – the breakable shields, the way pressing the attack button locks Caddoc into an attack animation rendering him unable to dodge, the complete absence of lock-on leading the game to make its best guess as to who you want him to hit and getting it completely wrong – is almost intentionally designed to alienate the player. The problems aren’t confined to gameplay either; Hunted is the worst PC port of a console game I’ve ever played. Kenti and I booted up the game at 8:30pm on a Monday evening, yet wasn’t until 9:25 that we managed to start the co-op adventure, due to various misadventures with port forwarding, having to disable the always-on built-in VOIP via a config file buried in My Documents and – inexplicably and criminally – having to play through the game’s tutorial before it would entrust us with the dangerous ability to log on to Gamespy and send the other player an invite. 1) Of all the things in Hunted they could have bitched about they picked the graphics as the number one issue dragging their game experience down. 2) The graphics aren’t actually that bad. Some of the effects are prehistoric and the animations aren’t great either, but the visual design lends itself to lush, eerie environments very well. Which makes it a bit of a shame that most of the game takes place in grey towns/grey caves/grey dungeons/grey castles, really. The most atmospheric areas in the game are the side-dungeons, which are optional areas the can be explored for a bit of extra loot. These are mostly very well done, containing different puzzles1 and traps and so-on, and if the entire game had been more like that I would probably not be as harsh on Hunted as I am. Unfortunately the game proper is a series of hack n’ slash battles against the same four or five types of enemy, with the occasional turret section and arena fight to liven things up. Even this wouldn’t have been so bad except for the way Hunted handles character progression. The way it works is that once you meet a certain milestone – X number of monsters killed in melee, partner revived Y number of times – the game gives you a bonus to your health, the number of potions you can carry, your damage and so on. The problem with this setup is that Hunted isn’t an RPG, where you can go off track and grind out some experience points to boost your character. It’s as linear as they come with too few baddies in the side dungeons to make much of a difference to the progression rate, meaning that said progression rate is essentially fixed. There’s no way to speed it up. This has the effect of intentionally crippling the players at the start of the game in a horrifying example of Level-1-in-Baldur’s-Gate syndrome. As a result, I hated the first third of Hunted. 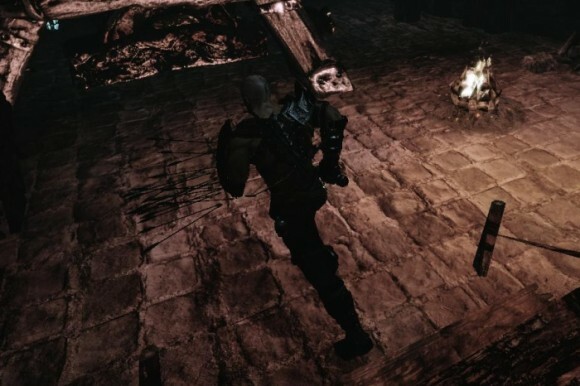 It was one of the most unfun gaming experiences I’ve ever had, when I was wrestling with the rubbish controls and the awful melee mechanics and went down in just three attacks from a berserker baddie – and to add insult to injury, the first two chapters take place in dark, bleak environments with no warmth whatsoever. Things did improve when we got into the forest since we could carry more than one health + resurrection potion and so had options in the case of an encounter with an enemy going horribly wrong, but it’s still one of the most baffling design decisions in a game absolutely chock full of them. And it didn’t end there. No, towards the end of the game we started to encounter the reverse problem: our characters were so absurdly powerful that most encounters were over almost as soon as they’d started. 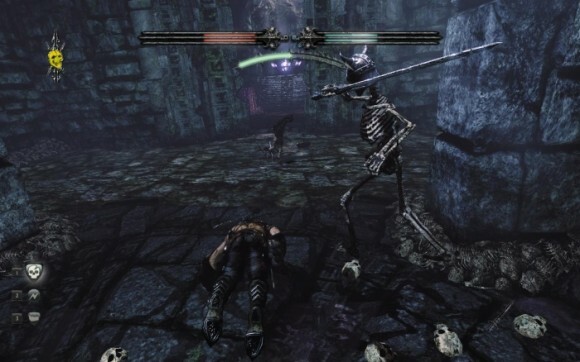 Minibosses that had been challenging when we first encountered them spawned and attacked only to be beaten to death with a shield in a couple of seconds. There was one occasion when the game presented us with a room full of pots containing potions, magic weapons, weapon racks, clearly gearing us up for a big fight – which consisted of Kenti hitting the big cluster of berserkers with a freeze arrow before exploding them in place while I batted the sorcerer type into the air with my shield and then tore his head off. I won’t deny that dispensing that level of mayhem after struggling so much at the start of the game wasn’t fun. It was fun, so this particular issue isn’t a bad thing, as such. It’s just symptomatic of the overall problem with Hunted, which is that it’s a game that hasn’t really been thought through. Time and again we ran into situations that hadn’t been tested properly, badly designed fights that were either far too easy or far too hard, bugs with bosses that resulted in a torrent of never-ending swearing. One time I even fell through the bottom of the level during a scene transition. The end result is a game that feels like it’s been made by amateurs – amateurs who may have had the best intentions, but amateurs nonetheless. There’s no other explanation I can come up with for why the game happily disregards so many of the basic tenets of game development I had – until now – taken for granted. Things like “basic UI features to monitor your co-op partner in a co-op game”. 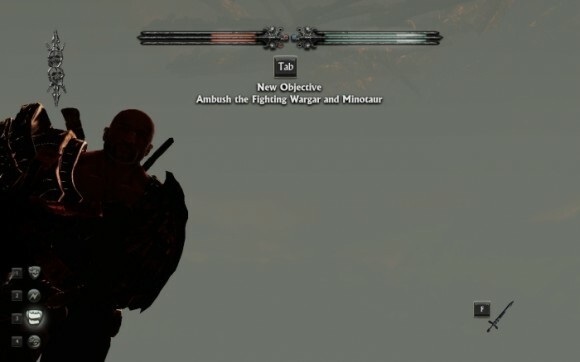 Things like “a boss whose presence and threat is built up over the course of a chapter only for the actual boss fight to consist of shooting it in the face with a fixed turret for thirty seconds”. Things like “the breakable shields are bad enough, so why would you intentionally piss the person playing Caddoc off more by having him comment on how flimsy his shields are every time he picks up a new one”. It’s a litany of hate that is almost never-ending, and so while I may have had some fun with it I can ultimately only give Hunted the scourging it so richly deserves. Note from glorious space-year 2013: The development team behind this game is inXile, they of Choplifter and the Wasteland 2 Kickstarter. I wouldn’t expect Wasteland 2 to be anything special. It is interesting to see how different people can have two completely different experiences with games. all the things you mentioned are pluses for me. The breakable shields are a nice addition they make it so the player can´t turtle up indefinitely, and also make it that by being persistent enough you can break an enemy shield whose defenses you had trouble overcoming. You also sometimes have to face the decision of trying to quickly dispatch an enemy, go help your partner, or look for a shield. pressing the attack button locks Caddoc into an attack animation rendering him unable to dodge, as it should be. locking the animation means you have to properly read the flow of battle and the enemies movements to correctly choose when to strike, like in the Souls series. I liked the absence of lock on. The animation transition is fluid enough that you can change targets to any direction mid-combo, which is sometimes essential in a fight against multiple enemies. Lock on against too many enemies means you take too much time to circle between enemies until you get to the one you want, or need to unlock, face the enemy and lock again. Hunted all I need to do was push the stick in the direction I wanted and attack. I may have played a patched version, since I never encountered a bug during the whole play trough.